In prezentul document, Reguli de Kata in Karate Fudokan - "KATA RULES - International Fudokan Karate Rules and Regulations" by World Fudokan Federation, publicat in 2012, am pastrat limba originala in care a fost publicat documentul pentru a transmite cat mai corect nuantele si intelesul acestuia. Regulamentul poate fi downloadat in format pdf, vezi link la finalul articolului. Contemporary definition of kata, made by majority of karate teachers, kata represents formal exercise training against several imaginary opponents. Recognizing the fundamental principle of Funakoshi Gichin’s kata definition (from his first book from 1922) - that kata is a set of karate principles, Fudokan kata rulebook and the whole competition system is based on his idea. Kata Competition demonstrates Fudokan Karate Kata through individual and team presentations. The Synchronized Team category demonstrates both Kata and its application (Bun-kai). Order of winners is determined by point scoring or flag scoring; the higher the score, the higher the winner's placement. The competition area shall be sixty four square meters. The competitor shall perform the Kata facing the main seating area in one of two positions, which are located 2 meters in front of and in back of the exact center of the competition area. The surface of the floor must be flat and neither too smooth as to be slippery nor too rough as to inhibit proper execution. The conditions shall be the same as those set forth under the Kumite Rules. The positions of the Judges and Court Clerks shall be those set forth by Appendix II. Competitors shall be required to select Katas from the following Fudokan and Shotokan list, although exceptions will be allowed in the case of different style Katas having the same origins but whose name pronunciations are different. Bassai (Pasai) Dai, Sho - includes Itosu, Matsumura, Yabu, etc. Roh-Hai, Sho-Dan, Ni-Dan, San-Dan Matsumura, etc. At elimination time, the scoring shall be determined on the basis of the viewpoint of Judges according to the formula of Basic Points minus Penalty Points. At final match time (except Synchronized Kata Application), the scoring formula shall be Basic Points plus Skill Points minus Penalty Points. Final matches of Synchronized Kata competition: Scoring is derived from scores of Kata (3 person) and Application of the same Kata. Smooth body movement (timing) throughout entire execution of technique - beginning from floor and ending at contact point. Degree of increasing energy through speed combined with smoothness of technique. Degree of total body contraction focused on target. Degree of strength of will ("Spirit") or mental power focused on target. Degree of emotional stability and mental concentration. Appropriate tempo to match the technique objective. Degree of techniques' quality based on depth of training experience. Degree of body movement combined with skill of technique. This refers to the level of impression the demonstrator makes on the observer as a result of both the demonstrator's understanding of application and display of high level of technical skill with grace and strong spirit. Kata Level- Scoring uses same criteria as individual Kata final match. Application of Techniques -Degree of proper delivery and quality of technique. Timing and Ma-ai -Degree of correct timing and proper distance during delivery of techniques. Choreography - Degree of realism and artistic delivery. Deviation from original position and angle; Note: If ending position is less than 1 foot from original position, then no penalty. Unrealistic technique (applies only to Synchronized Kata Application). In Synchronized Kata, if competitor(s) demonstrated a similar but different form or action, or executes a technique at a slightly different angle (not more than 45 degrees) than other competitor(s), then penalty 5-B applies. In Synchronized Kata, if competitor(s) demonstrated a completely different form or action, or executes a technique at a completely different angle (more than 45 degrees) than other competitor(s), then penalty 5-C applies. The Judges must meet at least twenty-four hours prior to the tournament in order to ensure scoring uniformity and consistency through review of at least three model matches. If Judges are unable to meet prior to the tournament, they may ensure scoring uniformity by together reviewing scores of first match of the competition (before assigning final score). A Han-soku shall be declared against a competitor in the following cases. The Shu-shin’s (Referee’s) indication of a Han-soku shall be the holding of a zero card overhead. K. When the competitor seriously violates any of the Competition Rules. Remark: The term, competitor, shall also refer to the members of a Synchronized Kata team. A violation committed by any single team member shall result in a penalty or Han-soku against the entire team. If any singly team member receives a Doctor’s Stop, this ruling shall also apply to the entire team. The demonstration shall be immediately stopped (Doctor’s Stop) whenever there is a Medical Decision that a danger of injury or illness exists to the competitor. In the case of Doctor’s Stop, no scoring shall take place. A. The Coach shall have the right to protest any matter related to the operation of the Competition Rules. However, the Coach may not protest any scoring decision of the Court Judge(s). B. The Coach’s protest must be made before the Court Judges leave the respective Competition Area. C. The Coach’s protest may only be lodged with the Chief Judge and not with the Court Judge(s). D. When the Chief Judge receives a protest from the Coach and after confirming that the protest concerns an alleged violation of the Competition Rules, the Chief Judge shall order Shu-shin to call a Court Judge’s Meeting. If the Court Judges determine that a violation has occurred, then if uncorrectable, the results are voided. (1) There shall be a maximum of twelve competitors per elimination pool. The top four competitors (teams) having the highest scores shall be selected from each pool for the next elimination round. This system of eliminations shall continue with each ascending pool until only the top eight competitors (teams) remain. The numbers for the first round elimination pools are as follows: 2, 4, 6, 8, 12, 16, 24 or 32. (2) The top eight competitors (team) as determined by (1) above shall compete to determine the top four competitors (teams) by final eliminations. (3) The top four competitors (teams) shall compete in the final matches. The individual competitor (team) having the lowest score shall compete first in the next eliminations re-pool round. In the case where the scores of the competitor (team) are the same, the pool group with the lower designation number shall compete first. When the competitors (teams) are from the same pool group and have identical scores, the competitor (team) who competed earliest shall compete first. Placement must be done by random drawing and not by human design or control. However, the competitors (teams) from the same country or from the same continent must be seeded. In addition, the winners (places 1 to 4) of the last tournament bearing the same title shall be seeded. It is possible to seed competitors from the separate pools. Seeded competitors in each pool should be last to demonstrate. B. The Court Clerks shall perform their duties under the direction of the respective Court Shu-shin. All competitors are required to use Karate uniform (Karate-Gi) as set forth by the Competition Rules. Eyeglasses are permitted. Supportive bandaging such as neoprene, elastic or multiple layers of tape is prohibited. Only a double wrap of tape is permitted. Shoes, socks or similar apparel. Weapons or related equipment. Exception approved by the Technical Committee at time of application of Synchronized Kata. Heavy bandaging exceeding minimum requirements. The competitor (team) shall select a Kata from among the Kata list. The competitor (team) can retain or change the Kata at each elimination round, except for the final elimination round and finals whereupon a completely different Kata must be performed. Competitor (team) must register name of the Kata to respective Recorder prior to demonstration. The scores from the elimination rounds shall not be cumulative. Final eliminations shall be conducted when there is only one pool remaining. The top four individual or team competitors having the highest scores shall compete in the final round in the same competition area. Finals must be conducted from one pool and in the same competition area. The final score shall be the sum total of the final elimination and finals scores. In the case of Synchronized Kata, the final score shall be the sum total of the final elimination and finals scores (Kata and Application). If during any point of the eliminations or final match, there are individual competitors or teams having identical or tie scores, add up all six original scores to determine winner. If a tie score still remains, then winner will be decided by Kettei-sen. In final match of Synchronized Kata, score is determined by total of Kata and Application. In case of a tie score, team with higher Application score is the winner. If Application scores are still tied, then winning score is determined by sum of original six scores of Application. Then, if tied, Kettei-sen.
At Kettei-sen time, the Kata selected by the competitor must be different from that which resulted in a tie score. In case of a draw in Synchronized Kata finals, then teams must again demonstrate only Application. The scores of the Kettei-sen shall not be used for computing the final scores. The Kettei-sen scores shall instead be used solely for determining the order of placement (breaking the tie). Only the original scores shall be used for computing. the final score for each competitor (team). Kettei-sen order decided by Court Judges Meeting. The competitor shall select either position marked as previously indicated in front of the main seating area. The name of the Kata shall then be announced and the demonstration shall commence. The competitor shall bear complete responsibility for any consequences caused by inadvertently stepping out of the Competition Area and thereby running into any impediments to movement. Demonstration Position the competitors shall select any position inside the Competition Area. Each competitor must mark own starting position with tape supplied by officials. During Kata Application demonstration, competitors must use one of the same starting positions as original Kata. The competitors shall bear compete responsibility for any consequences caused by inadvertently stepping out of the Competition Area and thereby running into any impediments to movement. The entire team shall be at fault. The members of each Synchronized Kata team must remain the same throughout the elimination. Members may not be added or dropped from a team. However, the demonstration positions are permitted to change. Competitor in position, bow to the Shu-shin and announce the name of the Kata to be demonstrated. The Court Announcer announces the name of registered Kata. If there is a difference between the Kata announced by Court Announcer and the Kata announced by competitor then Shu-shin must confirm. In the case of a Synchronized Kata, the team shall take a position in any part of the Competition Area. The team shall then bow to the shu-shin and each competitor shall place tape (approximately 5 cm x 20 cm) on floor for respective position and, from formal stance, the team captain shall announce the name of the Kata to be demonstrated. In case of final match of Synchronized Kata, Team -must demonstrate Application of Kata just completed. This is designated by Shu-shin calling "Bun-kai" (Application commences). Application -Involves three demonstrators with one demonstrator applying techniques of same Kata as the final round Kata. Two demonstrators take up attack positions. Make 4 attacks upon the Kata demonstrator, three single person attacks and one 2-person attack. The 2-person attack must be a simultaneous (same time) or "one-two" consecutive attack (the attack by the second person must begin before the attack by the first person is completed). The Kata demonstrator may engage each attacker only twice (two times). Example: In a simultaneous attack the Kata demonstrator utilizes an exact technique from the Kata to block both attackers initial action. This counts as one engagement with each attacker. The very next time the Kata demonstrator engages each of the opponents they must be dispatched. With the single person attack, the Kata demonstrator can only engage with the attacker twice. The engagement must be continuous demonstrating proper Zan-shin. Offense may use Bo (stick) 140 cm or shorter with diameter of 3 cm (+- 5 cm). Offense cannot use any techniques, which are distinct forms of any other martial art. The demonstrator must use the exact Kata technique against an attack with no change allowed. For example, after the first technique, if a block is used, then the demonstrator can use any additional counter technique. If a technique in the Kata is performed in slow motion, it can be performed at full speed in application demonstration. In case of a defense against two attackers, the fIst defense movement must be a technique from the Kata, but the second attacker can be met with any counter technique. When the demonstrator completes an application against an attacker, then the next action must be resumed from the Kata. The demonstrator must return to the original starting position. ​Demonstrators bow to each other. Only the offense side can place themselves anywhere in the Competition Area and either stand or kneel to Sei-za. Demonstrator begins the Kata. Offense, according to their prearranged choreography, executes the attack(s). If there is a time lag before the next attack, the offense side is required to either stand, or to resume Sei-za position until time of next attack. Kata demonstration completed. Team members bow to each other, face Shu-shi and bow. After the competitor (team) has demonstrated the Kata and has bowed to the Shu-shin, they shall exit the competition area as ordered by the Shu-shin. IIJ Synchronized Kata competition, each team member shall remove his or her floor position tape before exiting the competition area. If a Shu-shin discovers a penalty or two or more Fuku-shin (Comer Judge) indicate penalty after the demonstration of a Kata, then Shu-shin shall call a Court Judges Meeting. Court Judges indicate penalty by holding red flag on the left side then raising flag upright at knee. If Shu-shin finds no penalty or if two or more Judges do not indicate any penalty, the Shu-shin indicates no penalty. No penalty is indicated by holding white flag at right knee, then raising flag upright at knee. After penalty point decision, the Court Judges shall complete their Scoring Form. The Shu-shin shall then request their presentation of the scores by blowing one long whistle followed by one short, sharp whistle. The Court Judges shall each present their scores by holding their own Scoring Boards overhead. The Recorder shall collect the Scoring Forms from each Court Judge. In case of Synchronized Kata final match, Recorder does not collect Scoring Forms. The Announcer shall read each score aloud starting with the Shu-shin and proceeding clockwise. If a score is misread, Shu-shin shall request a correction from the Announcer. To direct the Court Judges to lower their Scoring Boards after the Announcer has read hem correctly, the Shu-shin shall blow one short whistle. In case of final match of Synchronized Kata, Shu-shin first asks for Court Judges to indicate Kata score via Scoring Board. Then after Announcer reads Scoring Boards, the Shu-shin requests Judges to show Application Score. After Application Score is read off, then Recorder collects Scoring Forms. In case of Kettei-sen, after Court Judges have completed Scoring Form, then next match begins (without showing Scoring Board). When all Kettei-sen are finished, then Shu-shin calls Court Judges meeting to determined order of ranking (1st, 2nd, 3rd). All Judges must follow the required dress code set by the Technical Committee. Hard board (25 cm x 40 cm). Left side with flip-over numbers from 0 to 9 in black and right side with flip-over numbers from 0 to .9 in red. The Court Judges shall be made up of one Shu-shin (Referee) and five Fuku-shins (Corner Judges). The Chief Judge shall make all judging assignments and position placements at each respective competition. Once assigned, the Court Judges may not change from their assigned pools of competitors. However, in the case of an injury or sickness that prevents the Court Judge(s) from continuing, the Chief Judge may make replacement(s). When this occurs, all the preceding competition scoring records of that particular competitors' pool shall be voided and the new competition must begin anew. The Chief Judge shall monitor the Court Judges judging. If the Chief Judge finds clearly unfair judging irregularities, a warning will be issued through the Shu-shin to the offending Court Judge(s). If, after the warning, the said judging irregularities persist, the Chief Judge shall order an end to the competition through the Shu-shin, subject to the approval of the Jury. When this occurs, all the preceding competition scoring records of that particular competitors' pool shall be voided and the competition must begin a new with a different composition of Court Judges as determined by the Chief Judge. Each Court Judge is required to score each competition. The highest and lowest scores shall be disregarded. The competitor (Team) score shall be the sum total of the remaining four scores divided by four (average score). The penalty points must first be decided by Court Judges Meeting. The Court Judges shall first write their scores on the official Scoring Forms (Individual and Synchronized Kata, and Application of Synchronized Kata). At this time, check „overview “of point scored, and then adjusts according to each element of scoring. Next, upon the Shu-shin signal, the Court Judges shall show their corresponding numbered Scoring Boards. The official Scoring Forms shall then be collected by the Recorder. In case of Kettei-sen, Court Judge must determine, by meeting, the order of winners. After Court Judges finish scoring, they do not display Score Board. The Shu-shin calls a meeting and order of winners is determined by vote. The Chief Judge is empowered to delegate authority to the Assistant Chief Judge(s) assigned to a separate court. The Shu-shin shall control the operation of the competition in accordance with the Competition Rules. The Shu-shin shall be responsible for ensuring that the competition area, the competition, and the judging are handled under the best conditions. If deemed necessary to fulfill these purposes, the Shu-shin may direct the Court Clerks, competitor(s), and Judge(s) toward the attainment of these optimum conditions. Furthermore, the Shu-shin must diligently and strictly monitor the scores announced by the Announcer from the Scoring Boards displayed by each Court Judge. If a mistake is made, the Shu-shin shall order a correction and re-announcement of the corrected score. The Shu-shin's discovery of a mistaken announcement shall be signaled by several short, sharp whistles followed by the Shu-shin pointing at the mistakenly announced Scoring Board with a red flag. When Shu-shin calls meeting, Court Judges assemble in front of the Shu-shin's chair. At the Court Judges meeting, each Court Judge including the Shu-shin, shall have an equal voting right. In the case of tie vote, the Shu-shin shall make the final decision. At the Court Judges meeting, the Fuku-shin report penalty points to Shu-shin who then determined what penalty points apply. The penalty points cannot be lower or higher than reported by Fuku-shin. If the Shu-shin finds a serious violation or if one or more Fuku-shin signals a violation, the Shu-shin must then immediately stop the match and call a Court Judges Meeting. Court Judges Meeting shall make the ruling as to the finding of Han-soku or for determining order of competitor's scores after rematch. If the Court Judges decision is that Han-soku has been committed, then the Shu-shin shall signal by blowing several short, sharp whistles while simultaneously holding a red flag straight, overhead which indicates zero points. The Shu-shin shall then order the competitor (team) out of the competition area. Upon notice of Doctor's Stop by the Medical Judge, the Shu-shin shall immediately stop the competition and request medical treatment. When the Shu-shin discovers symptoms of injury or illness, the Shu-shin shall immediately signal for the Medical Doctor and Medical Judge by crisscrossing both flags above the head. The Shu-shin shall neither use the whistle nor stop the competition. If the Medical Judge rules Doctor's Stop, then the Shu-shin shall immediately stop the competition and request medical treatment. In the case where one or more Fuku-shin discovers symptoms of injury or illness, the Fuku-shin(s) shall appeal to the Shu-shin by waving a red flag overhead from side to side. If the Medical Judge rules Doctor's Stop then the Shu-shin shall immediately stop the competition and request medical treatment. If decision of Medical Judge is not Doctor's Stop, then demonstrator must start again from beginning. Following each competition, the Recorder shall collect all Scoring Forms. The Recorder shall hold the Scoring Forms in order to verify that they are in agreement with the Scoring Boards. If a discrepancy is found between the Scoring Form and the Scoring Board, the Recorder shall disregard the Scoring Board score and adjust (the score based on the Scoring Form. The Recorder shall then notify the Chief Judge. The Announcer shall read aloud the Scoring Boards beginning with the Shu-shin and then proceeding clockwise with each Judge. As each board is read, the corresponding Judge's country shall then be announced. After all the scoring has been announced, the Recorder shall then add all the individual scores and give the total to the Announcer who shall then announce the average score. In final match of Synchronized Kata, Announcer first announces Kata score, then Application score, then total score. After a Kettei-sen is completed, all Court Judges bring in their scoring forms and discuss the results to determine first the ranking order. The Shu-shin collects all Scoring Forms, indicate their decision to the Recorder. The scores given to each competitor (team) must be clearly posted so that they are visible to all persons in the tournament area. In case of a Kettei-sen, scores are not announced, only the relative order (1st, 2nd, 3rd) beginning with the highest score. Regulamentul de karate "KATA RULES - International Fudokan Karate Rules and Regulations" by World Fudokan Federation, publicat in 2012, poate fi vizualizat sau descarcat si in format PDF accesand acest link. Varianta print a regulamentului poate fi comandata de pe website-ul federatiei sau de pe magazinul Federatiei Mondiale de Karate Fudokan. 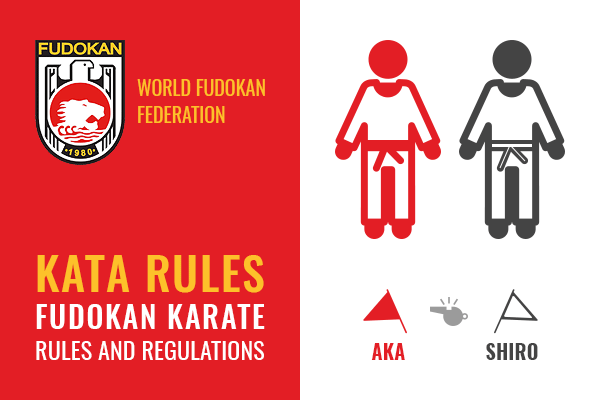 The Karate Fudokan Kata Rules according to World Fudokan Federation can be viewed as PDF accessing this link or you can order the book from World Fudokan Federation Shop.